Spent a good chunk of today upgrading the in-engine profiler, which had gotten so old and obsolete that I never really used it anymore, and preferred external tools for profiling. Well, that needed to change, because in-engine profiling is by far the most convenient. It also gave me a nice opportunity to break in my new interface system. 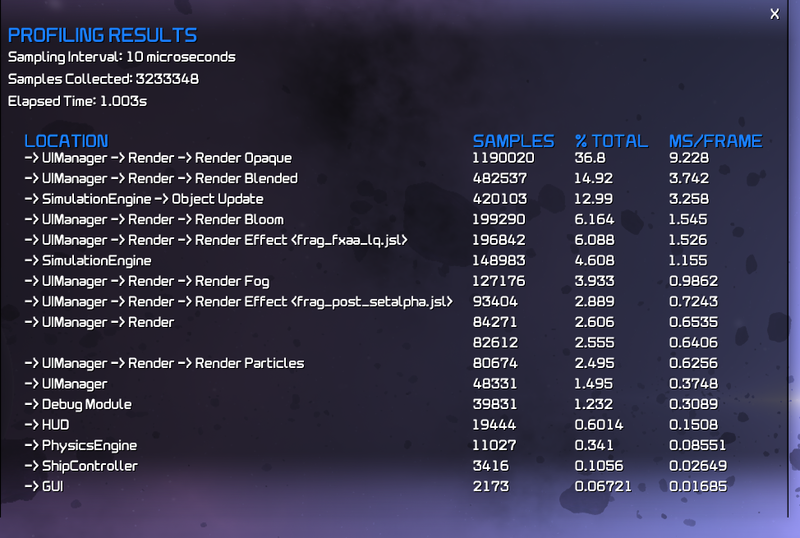 Thanks to this week's overhaul of the interface engine, I was able to cook up what I think is a great-looking profiler with almost not effort! Oh wow, that looks awesome. Both aesthetically, and in eliminating the "System.game.module.classwithtoolongofaname.engine.run.render() at line 34" kind of notation that most profilers use. Which kind of library are you using for this lovely UI? Not only the one you use for the profiling system but the one used ingame too (menus, icons, etc).